The crest from the old school building in Ashbourne. Two churches stand a mile apart in south-east Meath; the Church of St Patrick at Donaghmore and the Church of the Immaculate Conception in Ashbourne. St Patrick’s Church dates from 1840, while the Church in Ashbourne which replaced a former chapel was officially opened in 1889. The history of these churches is fully recorded in the history of the Diocese of Meath 1860-1993, volume 1 by Olive Curran. These churches served two district communities in two different parishes. Donaghmore in the parish of Curraha served the townlands of Greenogue, Ballaghaweaery, Macepool, Rath, Newtown, Wooten, Muckerstown, Fleenstown, Bullstown, Donaghmore, Milltown and Archerstown. Ashbourne which was in the parish of Ratoath, catered for Killegland, Race Hill, Cookstown, Hunters Lane, and The Rath, Hammondstown, Deerpark, Hickey’s Lane, Baltrasna and part of Milltown. The above town lands, in common with most rural Ireland suffered a decline in population in the 19th century. In the 20th century, the population remained static until the Sixties. The Great War (1914-1918), the civil war, the economic war in the thirties and the Second World War (1939-1945), all militated against any recovery in Ireland. Although families were large, emigration was the order of the day and reached its peak in the Fifties. By this time Ashbourne served not much more than 300 people and Donaghmore somewhat less. Yet agriculture and industry began to show distinct signs of improvement in the 1950s. In the Sixties a few new houses began to appear in the area. By the seventies these things gained considerable momentum with the “Garden City” and other developments. The population began to rise rapidly. The church was very aware of these changes and when Father Fintan Cassidy arrived as the first resident curate in Ashbourne in 1979 (the year the Pope visited Ireland) he had a big task ahead of him. This was a time of change in the church. With the introduction of the vernacular the laity became more involved in the ceremonies of the Church. Parish comities were started, altar rails were removed and altars were turned to face the congregation. Father Cassidy realised that Ashbourne church would soon be too small for the growing community. He was aided in his deliberation by a parish committee. Indeed they took swift action and by 19th December 1981 a fine large extension to the Church was being completed, and dedicated to our Lady by the Bishop of Meath, Bishop John McCormack. A parish house had also been built of the Church grounds at this time. Meanwhile the residents of Donaghmore had not been idle. Under Father Gerry O’Reilly, parish priest of Curraha, the Church which was in poor repair was roofed and decorated inside and painted outside. This work was to be later completed and the Church was beautifully restored by George Glynn when Father Burke parish priest. And yes! The statues were moved back, in pale colours and above the eye line, but back nonetheless. In the late Seventies new minds brought new ideas to Ashbourne and Donaghmore. It was considered that Ashbourne should enjoy the full status of a parish in its own right. Moreover, people of Donaghmore considered that the arrangement of Curraha and Donaghmore with Ashbourne in between was unduly cumbersome and the parish boundaries could be re-jigged to considerable advantage. Father Gerry O’Reilly was administering a spread out parish with a growing population on his own. It seemed to make sense to join Ashbourne and Donaghmore into one unit. These new ideas were aired at parish meetings. 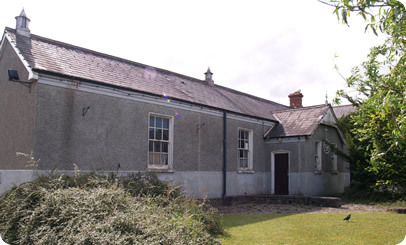 Father O’Reilly decided to consult the parishioners in Donaghmore and called a public meeting to be held in the new meeting room which has been built on to the Church by John Commons. However Father O’Reilly was failing in health at the time and fearing some controversy, he asked a parishioner to chair the meeting which he did not attend himself. One summer’s evening in 1982, the room was packed. Many spoke at the meeting and although there was support for the idea of a new parish some reservations were also forcibly expressed. Would Donaghmore lose its identity in a larger unit? Would the debts of a growing community in Ashbourne be too much for the smaller rural community? Would an older settled community be able to integrate with the new faster moving people of Ashbourne? I enclose a copy of the decree setting up the new parish. We have decided to call it Donaghmore out of respect of tradition and the feeling expressed to me. I would hope that the people will loyally understand our pastoral problems. I would ask you to continue to service Donaghmore for the present. I will be in touch with you when we get back from Lourdes. Father Martin Burke is being appointed, but he will not be in a position to move until the end of the month at least. That the union of the parishes of Curraha and Donaghmore be dissolved. That the parish of Curraha be erected into an independent parish. That a new parish be erected, consisting of the territory of the existing townlands of Donaghmore together with the adjoining townlands in the Ashbourne area of the parish Ratoath, viz Killegland, Baltrasna, Cookstown, The Rath, Hammondstown. That the new parish be known as Donaghmore. That the remaining townlands of the parish of Ratoath constitute the new parish of Ratoath. That the establishment of the new parish of Curraha , Donaghmore and Ratoath take effect on and after Sunday 19th September 1982. Father Martin Burke arrived to take up as duties in 19th October 1982 and was to continue as parish priest until 1999. During this time he was assisted by his curates Reverend Fintan Cassidy, Reverend Seamus Mulvaney, Reverend Philip O Connor, Reverend Brendan Ferris and Reverend Michael Meade. When Father Jim Lynch arrived to take over from Father Martin Burke, Ashbourne and Donaghmore had progressed to be a large thriving parish with nearly 8000 people, with curates, schools, halls, clubs, industries and all the other facilities of a growing community in modern Ireland. The 19th century churches now stand united in one parish and at the Christmas ceremonies in 1999, both St Patrick’s in Donaghmore and the Church of the Immaculate Conception in Ashbourne were packed to capacity. Older parishioners were heard to say openly, “the best ever”!